In October 2018, myself and Shauna were fortunate enough to be chosen to take part in the Lessons from Auschwitz Project and represent Enfield County School. I personally saw this as an amazing opportunity to spread such an important message about the Holocaust to my fellow peers at school, that may not be fully aware of the large-scale impacts it had on people’s lives and on our future. At the beginning of the Lessons from Auschwitz project we attended a seminar where we heard the testimony of a Holocaust survivor, Susan Pollack MBE, which allowed us to hear a personal account on the atrocities committed against Jews and other minority groups. 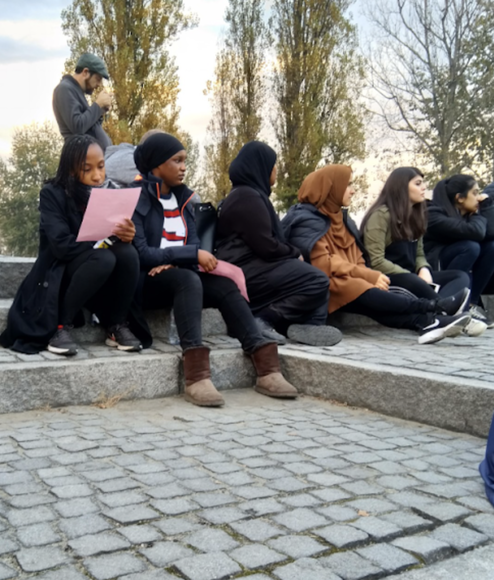 We were put into groups with other post 16 students from different schools around North London, and we discussed our previous knowledge about the Holocaust, and applied that knowledge when analysing pictures and sources from pre-war Jewish life. After hearing the survivor’s testimony, we reflected on how we would prepare ourselves for the upcoming visit to Auschwitz, Poland. Initially, I was unable to think of any methods that would prepare me for the visit, as I did not know what to expect when going to Auschwitz. Even though I had learnt about it in lesson and read about it in textbooks and online, that was just figures and facts on a page that didn’t really evoke any deeper thought, other than sorrow for all those that were persecuted by the Nazis and other collaborators. The trip to Poland put all of those figures and facts into context, and really opened my eyes and made me understand more about how he Jewish people and other minority groups were treated and the mass persecution and injustice they face on a daily basis. On the plane to Poland, I felt uneasy and anxious as the feeling of not knowing what to expect crept up on me. I had no idea how I would find the day and how to prepare for what I would witness. I also did not know how I would feel after visiting Auschwitz. Would I still be the same person after this visit? This was a constant thought that was circulating in my mind, as I had been constantly told before the trip that it was a life-changing experience, which proved to be correct. When we reached Poland, our first visit was to the town of OÅwiÄcim. This town was known to have a large Jewish population before the war, which by 1939 made up 58% of the population. It shocked me to learn that after the war, there were less than 100 Jewish citizens in the town, and in 2000 the last Jew in the town died. The town itself was very quiet when we were there, and there were only a few people that we saw when we visited. This made me realise what a big impact the Jewish community had in this town, and other towns like OÅwiÄcim that Jewish people were taken from. After our Auschwitz visit, both me and Shauna came back with new knowledge about the Holocaust that no amount of textbook or online source could teach us, as we had both seen for our very own eyes the place where one of the atrocious acts against mankind were committed, which made us both so motivated to spread our newly gained knowledge and understanding of the Holocaust through our Next Step Project. Me and Shauna both came up with the idea of representing this year’s Holocaust Memorial Day theme of ‘Torn from home’ by taking pictures of individuals’ keys and writing a few facts about themselves, such as their name, age, number of members in their family and one key aspiration they hope to achieve in life. Our aim with our project is to spread the message that the Jewish people were forcefully taken from their home, some with the thought that they would be returning, so they took their keys with them. Unfortunately we know that many of them did not make it home, but remembering them and showing that every key tells an important story about a person is our aim. A single key ties us to such an important, safe space that many people were taken from, and through our project we want to show how significant one key is to a person.